Liz and Jesse’s absolutely defined rustic elegance on their incredible wedding day at Glen Foerd Mansion…and they had a blast too. How could you not, with personalized “liquid courage” flasks arriving to the groomsmen via special delivery from the maid-of honor, and Liz’s own sleek turquoise “The Future Mrs. Elizabeth McGrath” flask? Liz and Jesse thought of every detail, from nostalgic memories to essential party gear. Not to be outdone, Jesse wore a rad straw hat with the word “Groom” on the hatband. He took it off for the ceremony, of course, but we got some awesome country-chic couple shots with it on afterward. And like I said, this couple thought of everything. The groomsmen even made sure to make a Philly Pretzel run after the ceremony. I mean, what South Jersey wedding is complete without soft pretzels? At the ceremony, Jesse’s dad sang, and it showcased how their families are already close as Liz and Jesse have been a part of each other’s lives for so long. One of the unique details that carried through the day was various aspects of trees and timber as accents. From the architectural angles of the church with wood paneling and deep stained glass to the tree rings used as centerpieces on the tables, nature was an essential part of the celebration. In fact, after the ceremony, guests enjoyed the incredible weather, playing yard games, throwing frisbees, and tossing beanbags into a handpainted “Liz and Jesse” beanbag board. And, carrying on the wood theme, guests were encouraged to write their own personalized messages on Jenga pieces. So clever. To add to the fun, the couple had customized “Liz & Jesse” sunglasses made for reception guests with a sign that read, “Don’t be blinded by our love. Grab some shades!” We made sure the wedding party grabbed some, for some very cool pics in the sunshine. Being on the Delaware River at the Glen Foerd Mansion was spectacular as the tent was open, and the summer breeze filtered through as people partied. The mansion offered opportunities for pics through their windows and outside in the open yard. It also allowed for our wedding video team to get beautiful film of the grounds, party-goer’s, and couple. After much dancing, singing, and laughter, the night ended with mini ice cream cones. Like I said, this couple thought of everything. 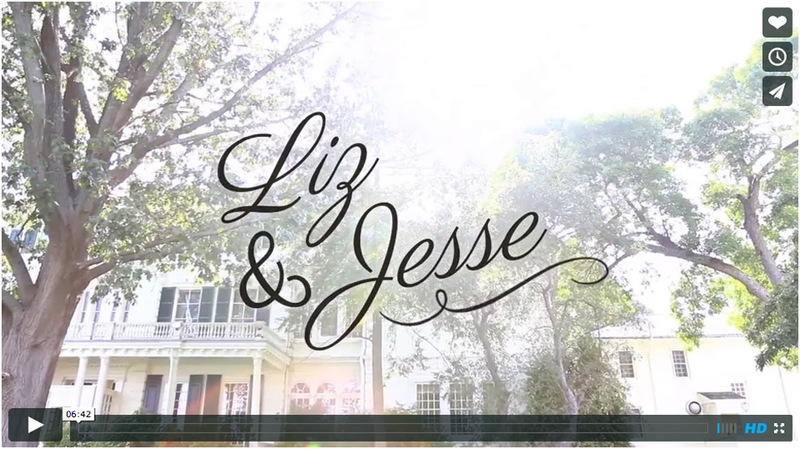 Liz, Jesse, we are ecstatic for you both and were honored to be with you as you started this new journey together.